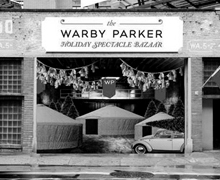 The Warby Parker Holiday Spectacle Bazaar embodied the spirit of the SoHo community but also the spirit of the designer entrepreneur. This past Winter, we visited the Warby Parker Holiday Spectacle Bazaar, an insanely cool space that curated a series of products, events, and projects. It not only embodied the spirit of the SoHo community but also the spirit of the designer entrepreneur. We got a chance to check out some of the Bazaar’s product displays, including Warby Parker frames and Best Made Co. axes, patches, and knives (all expertly curated within the canvas frames of yurts). We can tell you firsthand it doesn’t get much more hip than selling products in a modern version of a nomadic shelter, framed by Confetti Systems decorations. In case you haven’t heard of them, Confetti Systems is a duo that works as artists, designers, and stylists. They brought their love of celebration and craft-making to a full-fledged business that art directs installations for fashion brands, music clients, and cultural institutions. Best Made Co., founded by designer Peter Buchanan-Smith, has become a household name known for its beautifully hand-crafted, custom-painted axes. Being hip is good—socially good in Warby Parker’s case. The eyeglasses purveyor has made a business out of selling well-designed glasses to fashion-forward customers and giving back at the same time. For each pair sold, they give a pair to someone in need. The spectacle has ended, but Warby Parker spectacles keep giving all year round. Read more on Warby Parker and Best Made Co. in our posts here and here.